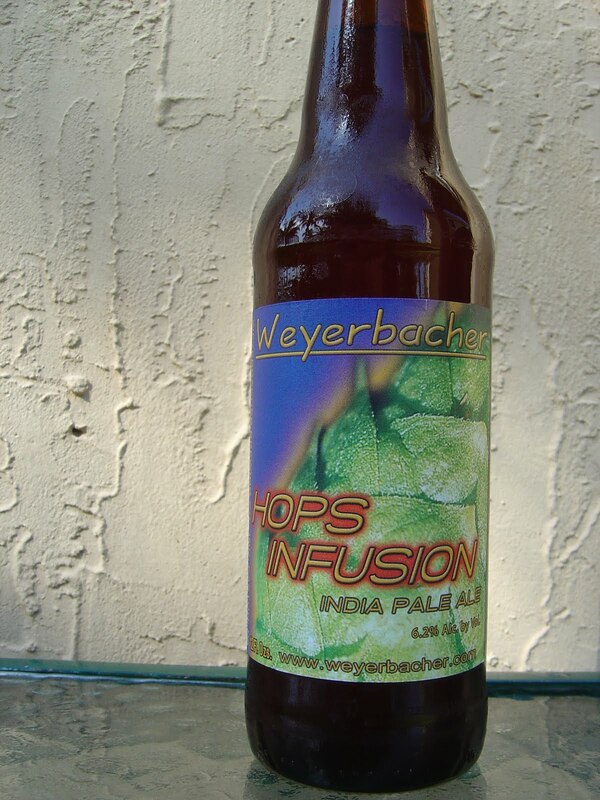 Tonight I'm drinking Hops Infusion India Pale Ale brewed by Weyerbacher Brewing Company in Easton, Pennsylvania. I know you've been long time readers, but as a reminder, Easton is where my father grew up and where I spent a significant amount of time for the first 30 years of my life. Ah, the Christmas Eves at Porter's Pub! If I didn't live in crappy Florida, I'd still visit my Aunt and Uncle there more frequently. Anyway, originally reviewed 16 months ago, I barely remembered the name, so here we go again. Citrus, hoppy, lightly toasty and bitter aroma. A fleeting glance of caramel, bread and malty flavors start things off. Those are immediately pushed aside by strong citrus and bitter lemon rinds. The two opposites didn't really mesh very well, rather just duked it out on the front yard. Did I mention there was plenty of lemon? Some spicy components along with the 6.2% alcohol make an appearance. The alcohol further severely dries out the finish and provides a little burn, not unwelcome but slightly harsh. The end also shows some medicinal flavors mixed with more lemon rind, a bit of a turn off. Decent all around for sure, but not great. I've had Weyerbacher's Juliet, and I rather liked it. But that is the only Weyerbacher I have tried, even though I went to school in the Neighboring town of Bethlehem. Juliet, I've heard the name, but don't know that beer. Weyerbacher sends us around 5 or 6 of their beers here in Florida right now. Most of those are solid beers. Wondering why more people don't rave Weyerbacher like they do Victory or Dogfish Head. My guess is that they are not quite there yet. Crazy Indiana Chick wants to leave a comment, but says Blogger is down. Doesn't she know Google runs the world? 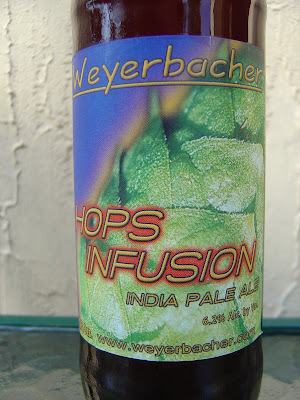 I love most beers from Weyerbacher, but fine Hops Infusion to be a simple IPA. I feel that Double Simcoe is their best beer- Great Double IPA, the Simcoe hops take it up a notch- as well as their Merry monks being a nice Triple that I enjoy in the summer as well as the winter. Sounds pretty standard, probably will skip this one. I definitely know the name Weyerbacher but unlike JayZeis above I haven't tried them before. Sounds like I'll have to try the Double Simcoe.